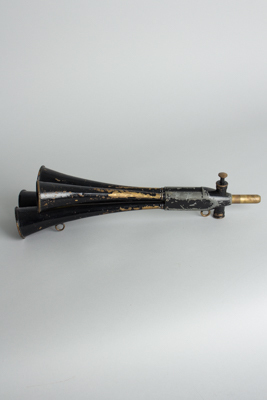 Martin DB 81 Model Schalmei Signal Horn, c. 1930's, made in Germany, brass horns, cast metal body. 4-bell, 1-valve. Bell stamped with oval Martin Signal Arrow logo. Overall length is 16 in. (40.6 cm. ), 2 in. (5.1 cm.) diameter of bell. Overall Very Good + Condition.